If you missed #35 click here. Best Moment: I loved the grudge matches, and particularly, the videos that came with them! 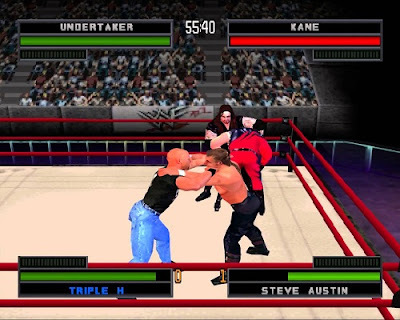 Before WWE Smackdown games took over, there were a couple of wrestling games that made quite a big impact in the late nineties. On the Nintendo 64 you had WWF No Mercy. 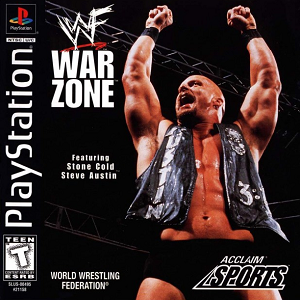 On the PS1 (and also on the N64, to be fair) you had WWF Warzone. This was the first wrestling game I played. I had only just got into wrestling and thought this game seemed really awesome at the time. Little did I know that things would get so much better quickly with the Smackdown games! That being said, at the time this was good. You could have four wrestlers wrestle each other at the same time and the finishers looked awesome. You could challenge for titles and sometimes wrestlers would challenge you, in what was called a "grudge match". It used to show these awesome video promos of the wrestlers challenging you. I used to find them really awesome, because it was the actual wrestlers talking rather than the blocky characters. It's a good game this, really good at the time, but as I said, the Smackdown games were to take wrestling video games to a whole new level a couple of years later. What is my 33rd favourite PS1 game? Click here to find out!